In a shock move, ex-MP David Jamieson gained the official party nomination for the £100,000 post vacated by the recent death of PCC Bob Jones. Richard and Frank Smith signed a new tenancy deal with Solihull Council – two months after the authority threatened to kick them out of their home. 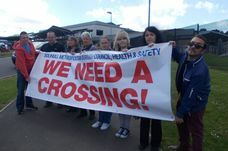 A ROW has erupted over which details surrounding plans to expand Touchwood shopping centre can be discussed in public. SOLIHULL Council is calling on the Government to allow local authorities to have the final say when it comes to academies changing their admissions policy.